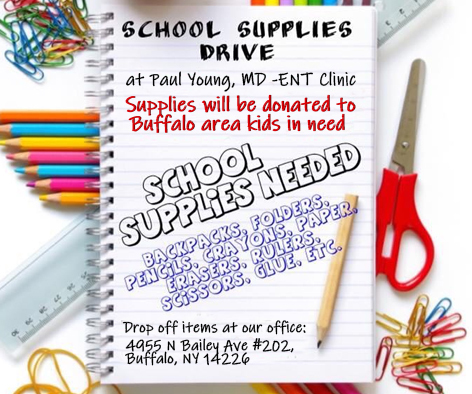 Supplies will be donated to Buffalo area kids in need. Backpacks, folders, pencils, crayons, paper, erasers, rulers, scissors, glue, etc. You Don’t Have to Suffer with Nasal Polyps! What are nasal polyps? | When chronic inflammation frequently recurs in the nasal cavity, growths can develop on the mucus lining of one’s sinuses. These soft, pale, teardrop or grape-shaped growths are called Nasal Polyposis or Nasal Polyps. While the polyps are painless and range from mild and unnoticed to obstructively large in size, they can block the nasal passageways and cause problems with breathing. People prone to this condition are those who cope with environmental allergies, frequent sinus infections, asthma, extreme sensitivity to aspirin, and certain immune disorders. Nasal polyps can occur at any age, however they are more common after age 40 and more prevalent in men than women. Children who have cystic fibrosis also tend to experience polyps in their nose. Nasal polyps can occur in both nostrils or sinuses, and may gradually grow larger. What Allergy Pills Can I Give to My Children? When the snow finally melts in Buffalo, NY, kids can’t wait to play outside. Discover which allergy pills you can offer to children who suffer from hay fever. Is OTC Allergy Medicine Okay for Dogs? Dogs in Buffalo, NY can suffer from allergies just like people can, but be careful because not all OTC allergy medicine is meant for dogs.